You need to reshape your blade’s edge and get it back sharpened when it is dull. Sharpening stone, water stone or whetstone are the tools used for this purpose. They come in a wide range of size, shape and material composition. Also, stones may be of different grades according to the grit size. Sharpening process consists of two processes grinding and honing. Dull blades waste your valuable time and energy. After Sharpening your blades, it will become new! They will help you in a survival situation when you need them. Sharpening stones are a widely used tool to remove dullness of cutting tools like knives, machetes, scissors, axes, razors and so on. Different techniques have been developed over the centuries. 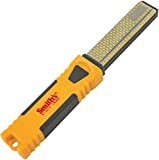 So, let’s learn about the basic sharpening techniques! Firstly, you’ve to select the blades/knives that need to be sharpened. Check the blade sharpness. Is it really dull or not? This will help you to choose what types of sharpening stones you need. After determining your blade dullness, it is easier to choose the appropriate sharpening stone. Different types and grit sizes of stones are available. You need to choose between them according to your need. Water stones are most common. You’ve to dip them in the water for about five to fifteen minutes before you use one of them. Because of this constant soaking and drying, these stones become very brittle. Oil stones are very durable types as they are made from aluminum oxide or silicon oxide. These stones need splashing of oil on the surface before you use them for sharpening. This type is the cheapest one. Ceramic stones are the best if you are looking for the long-lasting ones. You don’t need any oil or water to pour on the surface for this type. Careful handling is needed for using one of them. You also need to scrub the ceramic particles from the stones after sharpening is done. That’s why people aren’t used to using them on a large scale. Diamond stones are undoubtedly the best sharpening stones available in the market. Because of their strength and long lasting abilities, they are the number one product category. Also, they are very expensive, and they’ll last the longest. Certainly, you’ve to select the stones which are leveled with various grits on both sides. Basically, there are three types of grits defined based on how fine polish you are going to give your blade. Coarse grit is used for removing chips from a damaged blade. Medium grit is used for smoothing a rough edge into a medium edge. Finer grit is used for polishing an edge for getting a smooth finish. 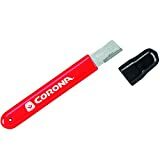 Use a coarse grit sharpening stone first if your tool is very dull. Then, you can use a finer grit. On the other hand, if your job is less dull then start with medium grit stone followed by a fine grit stone. The more the grit levels used the finer the cutting will be. C-clamp or vice or even a damp cloth or towel needs to be set under the stone so that the stone will not slide. Both stone and cloth/vice are placed on a flat surface. Take the blade and start with the coarse side or medium side of the stone depending on which types of sharpening you want. If necessary, use lubricant to your stone to make the sharpening process easier. Remember that, you have to choose the appropriate lubricant according to your stone types. Using the manual that comes with the package will help you in this case. Sharpening angle is very important during any sharpening process. If the blade is straight, then the 22.5-degree angle is appropriate for sharpening. If your blade is very large or thick then larger angle needs to be applied for sharpening. Hold the blade handle with your strong hand. By the other hand apply pressure to the side of the blade. Start drawing the blade forward and backward continuously with a certain angle. Change the grit size when needed. Repeat these actions for the other side. When sharpening is finished, check the edge of the knife. Next, clean both of the stone and blade after the process is over. Keep them in a dry place for further use in the future. Be careful while sharpening your blade otherwise serious injuries can occur. A dull blade also can cause damage to your hand. So, be careful when you apply pressure during the sharpening process. Always move your hand along the edge of the blade or knife. That will keep your hand safe from getting hurt. 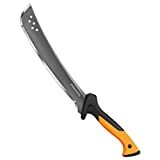 Safety is a paramount issue when you are dealing with knife or machetes. Also, keep an eye on the sharpening stone kit when soaking. If it is soaked for an excessive time, then the brittleness will be an issue. After the process, take care of the sharpening stone set properly. Wipe the stone with a clean cloth so that no residue is there. Be sure to use the sharpening stone grit chart for the optimum result if you are a novice in sharpening. There are many types of stone out there. Best knife sharpening stone kit is always difficult to discover. Among the top quality types, Japanese sharpening stone, Lansky sharpening stone, the sharp pebble is very well-known. Double sided diamond sharpening stones are one of the best and also expensive. So, be very cautious about your choice. 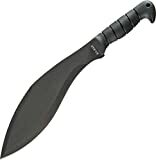 You can also use them for sharpening machetes if they are not kukri types. 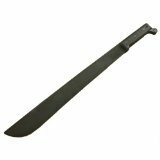 As top-quality machetes need careful handling and different categories are there, be aware of their shape and size while you use a sharpening stone. Keeping the edge sharper on your blade is important for your own benefit. This will save your energy and precious times. So, pick the right gear and accessories and follow our guidelines accordingly. You won’t become a master of sharpening instantly, but practice will make you perfect one day. Keep practicing and keep enjoying the process. You will find more pleasure in that way.